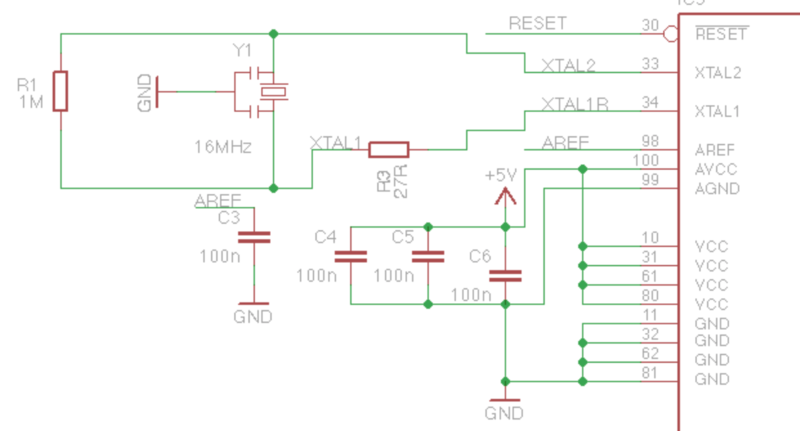 Whats the function of the resistor between MCU and its Resonator in Arduino Mega? Why is it there and what is its function? That resistor limits the drive through the crystal. If the power applied to the crystal is too high then the slope and phase shift at the resonant frequency will not be optimal and at really high drive levels could cause mechanical damage to the crystal (like that shattered wine glass trick). See good instruction PDF here, section 2.1. Not the answer you're looking for? Browse other questions tagged arduino-mega or ask your own question. Arduino Mega & WiFi Shield; why web server every time says my A7 pin reads 0V? What does Arduino do in 15ms? What are these components in Arduino Mega Schematic? Using the Arduino compiler, is it possible to use Atmega2560 interrupt pins that are unused by Mega? When using an Arduino as an ISP, is the capacitor required or not?